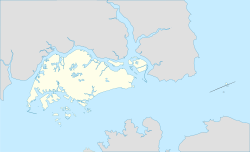 Anchorvale is a neighbourhood of Sengkang New Town in Singapore which is located between Sungei Punggol and Compassvale. The house numbers of the public apartment blocks in Anchorvale begin with the number '3' (3xx). These housing estates were fully completed by the Housing and Development Board (HDB) in 2001. The Anchorvale neighbourhood is linked to Sengkang Bus Interchange, Sengkang MRT/LRT Station and Compassvale Bus Interchange at the town centre via bus services originating from the Sengkang Bus Interchange, Compassvale Bus Interchange and other parts of the island. The west loop of the Sengkang LRT Line also serves the area, at the Cheng Lim, Farmway, Tongkang and Renjong LRT stations. Service 110, which plies between Compassvale Bus Interchange and Changi Airport, connects residents to the 4 airport terminals and the bus stops along TPE after Punggol Road. It also serves as an alternate service towards the airport for residents living at the town centre, and Fernvale residents living close to Anchorvale. Wikimedia Commons has media related to Anchorvale Garden.